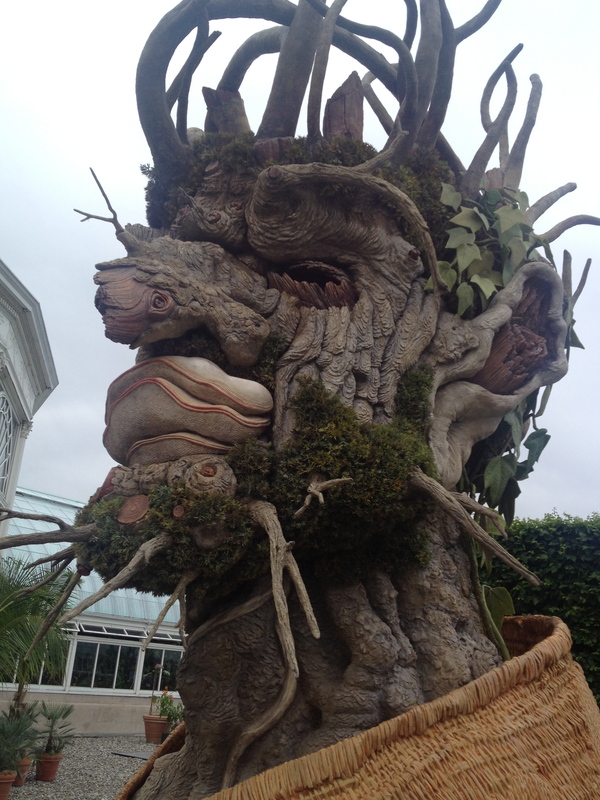 The works of Giuseppe Arcimboldo have been stunningly re-imagined for a new exhibit at the New York Botanical Garden…. As the titanic doors to the Victorian-style greenhouse swing open you are immediately whisked back to the days of its inception1. A time where socialites gussied up in their tall, stiff collars and thin neckties drank Brandy in such venues with their lady in arm, narrow skirts and raised waistlines hugging their hourglass corseted frame. The steel-skeleton glass houses, which are made up of a series of grand pavilions triumphantly crescendoing upon one majestic central dome, the centerpiece of this glorious edifice, allow light to drench the room with color and warmth. Beneath the transparent ceiling resides a sea of wonders, a vegetative fantasy comprised of eleven distinct habitats. You float through a dense tropical rain forest, a cactus filled desert, an ever-changing landscape of flowers and foliage. You get lost, held under an intoxicating spell, until you are released from the hold by simply wandering into the greenhouse’s rear courtyard, where even more curiosities await. Just beyond a glistening reflection pool dotted with lily pads whose origins can be traced back to remote bodies of water throughout the globe, you stumble upon as unique a sight as you will ever encounter. Neatly framed within boxwood hedges stand dominantly four imposing monsters, fifteen feet in height and looming above you in a menacing stance. Organic in nature, these four prodigious sculptures lure you towards them and invite you to experience their awesome wonders, and challenge you to understand them. Such is Four Seasons by Philip Haas, at the New York Botanical Garden. Philip Haas is an artist and a filmmaker, most notably 1995’s “Angels and Insects,” who has boldly endeavored on the momentous task of bringing to life the works of the famed Renaissance artist Giuseppe Arcimboldo. Arcimboldo’s paintings have fascinated art critics and fans for centuries. He was an Italian painter best known for creating avant-garde portrait heads made entirely of objects such as fruits, vegetables, flowers, and other organic matter. He painted the representations of these objects in such a way that the whole collection formed a recognizable likeness of the portrait’s subject. It is wild stuff; the type of painting you can lose yourself in, have an experience with. And although the images created by Arcimboldo are intoxicating on face value alone, there is far more to it. Arcimboldo, it is known, didn’t simply use random objects placed where they best fit, rather there is profound meaning behind the decision to use a mushroom for an ear, peaches for cheeks, and so on. Each object is related by characterization and he does this to whimsically tell the tale of human nature. Scholars have long analyzed Arcimboldo’s use of imagery to make political commentary2 and discuss his societal views satirically. It’s heavy stuff, as layered as you want it to be. Giuseppe Arcimboldo was a visual jester from an eccentric period of art history, Mannerism, when society sought out the bizarre and the superfluous. Technically, he was a still-life painter, where at first glance his portraits exemplify extravagant fruit medley. While another glance reveals the portrait of a human face. The pictures Arcimboldo created are so unique that it is impossible to look at them the same way twice. It’s an intense experience, one that you can now encounter in a whole new way thanks to Philip Haas. Haas gives viewers a fresh perspective on Arcimboldo’s works by blowing up the scale to mammoth proportions. What was once a two-dimensional experience is now a three dimensional interactive adventure as viewers are left to walk around the sculptures, to see the subjects from all sides. The exhibition takes us on a journey through the four seasons with each sculpture representing a different one. Spring is composed of over 100 flowers; summer has fewer elements, ones that are large in scale and thus easier to dissect. Fall is a cornucopian arrangement, and winter highlights the nakedness of the dormant season. The four sculptures are placed within the courtyard of the Enid A. Haupt Conservatory so that they are facing one another in a square configuration, creating a dialog between the four pieces within this very formal setting, and this is by design. Haas formatted the exhibit as a traveling show3 and he has exhibited the sculptures in an original way in each new location, so that the experience will be different in each environment4. By re-imaging portraits that on canvas are only a few feet high and transforming them into fifteen foot high sculptures, Haas has given us the opportunity to intimately acquaint ourselves with some truly mind-blowing works. For those fascinated by the works of Arcimboldo, I recommend the novella “The Coming of Vertumnus” written by Ian Watson.